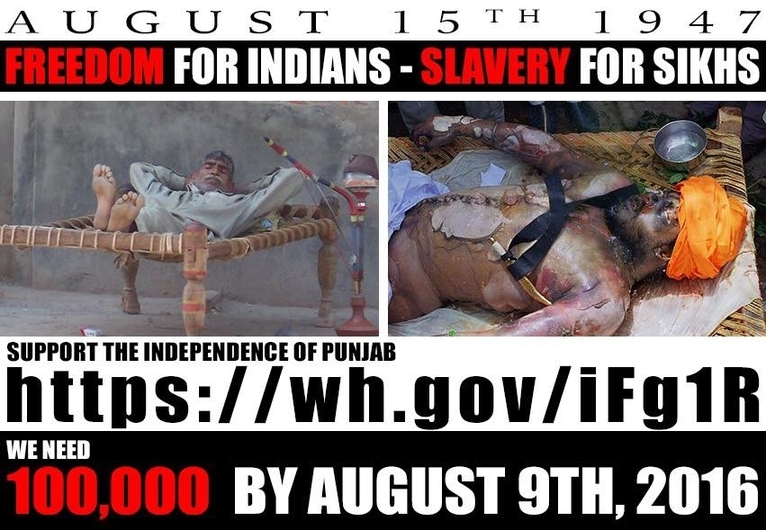 Home » Sikh News » How To Sign Petition :- August 15th is NOT Independence Day For Sikhs. SUPPORT the Liberation of Indian Occupied Punjab to Create “KHALISTAN”. 3.) Confirm :- Open your Email,, u have a new email from We The People Petitioins.WhitHouse.Gov and verify your signature ,,,,, by click on confirm your signature by clicking . FINISH . 1947 did not bring independence for Sikhs in India where followers of Sikhism, the world’s 5th largest religion are labeled as “Hindus”; Sikh Golden Temple was destroyed by Indian Army; Sikhs were subjected to genocide in Nov 84 and thousands were extra-judicially killed by security forces for demanding right to self determination.